I am back with a few tips on how you can transform your garage beyond recognition. We have a car, but we used our garage mostly as a dumping point for all sorts of crap (pardon my French!). We stored electric appliances, an old sofa and a wooden chest (I will let you know what we did with it later on). For this reason we decided that we had to do something about this mess! 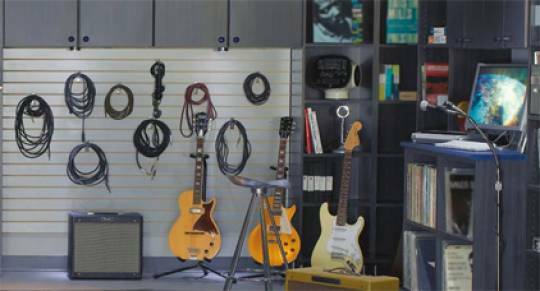 We didn’t mind parking our car outside and we used all our creativity to transform the garage into something more useful – a studio for the garage band of my husband. It may seem cheesy that my husband wants to have his garage band and a place to practice, but he is a really good musician and deserves it. As you can see from the picture, playing in the middle of the living room is not convenient at all! We decided that we want to put all his instruments and equipment in the garage, arrange it nicely and then add a table football and a pool table (hopefully). We are also planning to form a bar area, with a fridge and some stools. After all he needs an audience, and we can really use the space when we have more guests. So, what to do if you want to turn your garage into a room or an entertainment centre/man cave etc? 1. Get rid of all the clutter. Seems pretty obvious doesn’t it? Well it is a bit more complicated when you have to put it in practice. Why is that? Some of the stuff will bring back old memories and you might have difficult time getting rid of them.. If you want to transform your garage into a room or a nicer area you need it empty. 2. Empty and clean. I couldn’t clean the entire place myself and I didn’t want to ask friends to help me, cause that would’ve made me feel like I couldn’t handle my chores. Instead, I called professional removal services to pick all the unnecessary stuff (we got rid of that old sofa). In addition, I also asked professional North Melbourne cleaners for help. There were oil stains from the car on the floor, as well as some other stains on the walls which I couldn’t remove myself. Calling professionals was definitely worth it. 3. Flooring. You may or may not want to stick to the flooring you already have in your garage. it is entirely up to you. Steven thought that if we leave our original flooring (concrete), it will be too cold on the feet. In addition, concrete would’ve made the entire “room” look ugly. We decided on laminate flooring. It is easy to maintain and relatively cheap and looks amazing. 4. Decorate with taste. If you do everything right, all your neighbours and friends will go “Aww!”. The bottom line is that, if your garage has been built in the last 25 years, there shouldn’t be a problem to convert it to a bar area, games room, a man cave, or even a library and an office. Use your imagination, unleash your creativity. I wish I could show you the entire garage, but we are still not ready with the bar and fussball area. Still, Stephen has great time, playing in it.